Today we had an excellent workout and exploration of the two large glaciers on the West Coast that come down close to sea level. At the top of both is a single snowfield which is so large that it forces the glaciers to come much further down the mountain than is typical. 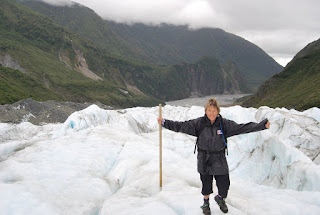 Pat decided to go to the quieter town of Fox and take a full day trip walking to Fox Glacier, up the front (dangerous without a guide) and upwards on top of the glacier. She explored caves, tunnels and crevasses. 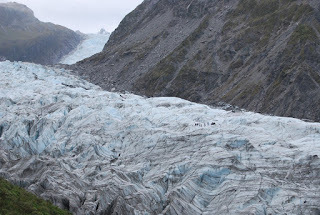 The dots in the middle are people, the glacier is BIG. 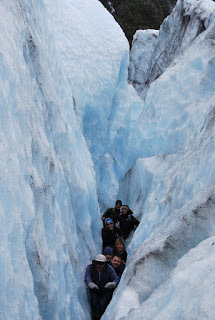 Mark decided to take a full day trip Ice Climbing at Franz Josef Glacier. 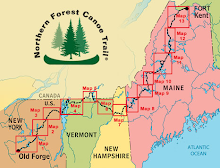 We had excellent guides and the trip leader Mike who had traveled and worked around the world had many adventure stories to tell. 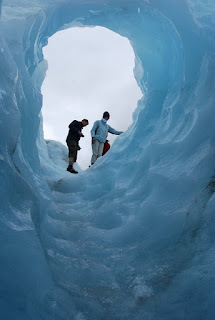 The company provided the equipment - mainly ice axes and ice climbing boots. Climbing the face... can you see the climbers? Descending at the end of the day. Note the large group of people in the middle of the picture (they are dots). What a day. Ice Climbing for a beginner is very tiring. A nice warm soak at the Glacier Pools Spa that evening in Franz Josef town provided the perfect recuperation!